New York City’s museums have come a long way from the pricey, boring cafes of the past. 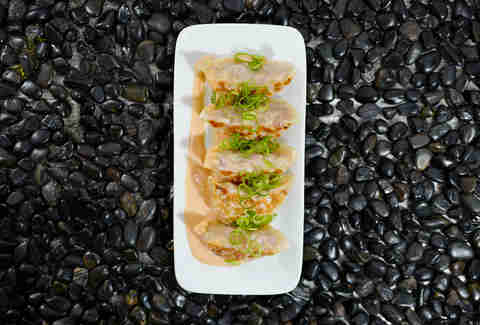 In recent years, museums all over town have revamped their food offerings to match the caliber of the art they house, many with help from recognizable names in food and hospitality. From a wine bar with seafood small plates to an Indian restaurant paired with Indian art, these are the best restaurants inside NYC's museums. Estela’s Thomas Carter and Ignacio Mattos have brought a bit of Downtown to the Upper East Side with their full-day operation inside the Met’s contemporary wing. By day, the lofty space serves as a cafe with Parlor coffee and creative pastries from Chef Natasha Pickowicz (think black cardamom sticky buns and buckwheat chocolate chip cookies). 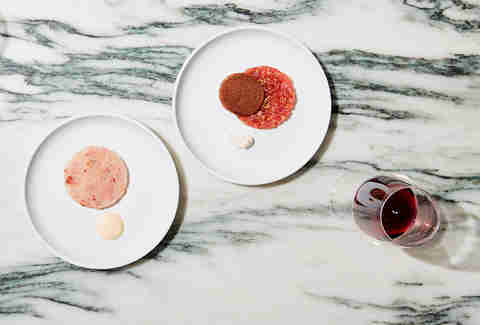 At night, Flora transforms into a wine bar with an elevated, seafood-forward menu that perfectly displays Mattos' ability to craft simple yet creative dishes like lobster crudo dressed in shiso with a side of fresh-whipped butter. Hugue Dufour and Sarah Obraitis’ daytime-only cafe may be modeled after a classroom -- complete with a green chalkboard menu and cubbyhole desks -- but the food is far better than your middle school lunch. 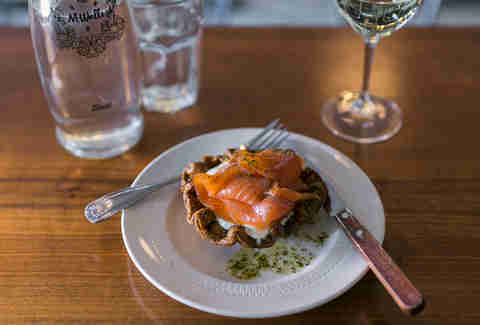 The short menu is split into two categories: salads and pies, featuring upscale, savory spins, like the Dufour’s Gravlax Pie, which takes all the familiar ingredients of a lox plate and transforms it into a flaky puff pastry crust filled with lemon potatoes, sour cream, dill, and slices of cured salmon. 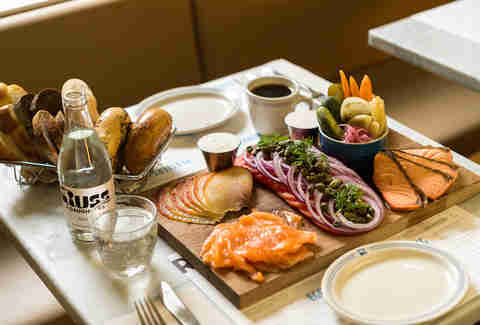 Lower East Side lox icon Russ & Daughters has been on an expansion tear as of late, first making its debut Uptown, and later this year, crossing the river into Brooklyn. The menu at this minimalist cafe-meets-appetizing counter at the Jewish Museum boasts a mix of old and new -- you’ll find the shop’s signature smoked fish boards and noodle kugel alongside shakshuka and vegetarian chopped “liver.” It's also the first time in 102 years that Russ & Daughter's has gone fully kosher. Salmon may be R&D’s signature fish, but the smoked tuna shouldn't be missed (especially when paired with horseradish dill cream cheese and wasabi roe in the Fancy Delancey sandwich). In an ode to the Rubin’s Himalayan and Indian art, Café Serai -- helmed by Stephen Starr alum Ali Loukzada -- specializes in a mix of traditional dishes from the region, plus others that hint at the museum’s Tibetan focus. Butternut squash, served on toast with ricotta and arugula, is roasted in masala spices and pan-seared salmon comes on a bed of spicy black lentil stew, while the traditional momos (South Asian dumplings) get a New York twist, stuffed with reuben sandwich-inspired fillings and served with Russian dressing. 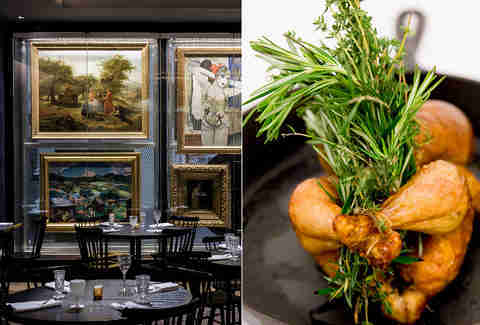 It’s not often that a museum restaurant gets a two Michelin star rating, but then again, not all museum restaurants are helmed by Danny Meyer’s Union Square Hospitality Group. The Modern offers two different dining experiences -- a prix-fixe in the room overlooking MoMA’s Sculpture Garden or an à la carte menu available in the cozier, recently renovated bar area. 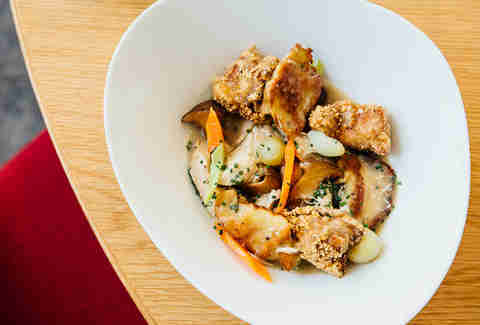 Both offer a taste of Chef Abram Bissell’s fancy French-inspired cooking, including an ever-changing preparation of foie gras. Tucked inside the city’s only standalone museum dedicated to German and Austrian art, this charming, wood-paneled cafe easily transports diners from Fifth Ave to Europe. Chef Kurt Gutenbrunner’s Viennese specialties complete the experience with things like beef goulash and bratwursts. 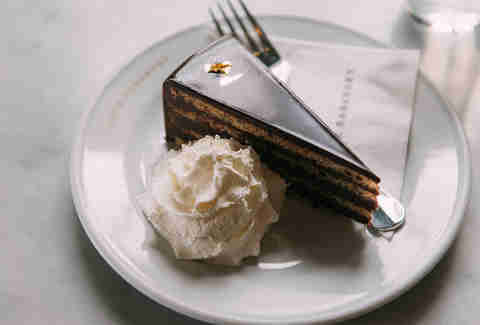 Café Sabarsky is also one of the few places to get a slice of classic Sachertorte, a Viennese chocolate cake layered with apricot jam and rum syrup. 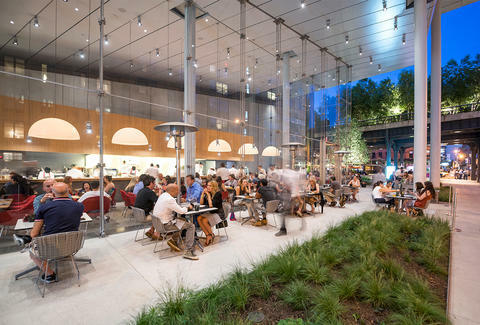 Danny Meyer knows a thing or two about museum restaurants (see above), so it’s no surprise this revamp of his Whitney Museum restaurant became an instant hit -- and not just with tourists. Untitled offers bright, seasonal dishes from Gramercy Tavern Chef Michael Anthony (known for producing vegetable- and seafood-driven plates), plus elevated comfort-food desserts by pastry chef Miro Uskokovic’s -- all of which come from an open kitchen inside Renzo Piano’s glass-enclosed dining room. Be sure to order the chicken, which is done up two ways here -- the breasts are roasted until juicy in the rotisserie and thighs arrive fried. In 2013, the Brooklyn Museum tapped longtime Brooklyn chef Saul Bolton, to oversee its culinary operations. 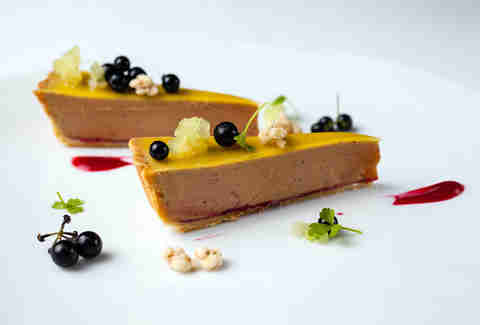 Bolton originally moved his eponymous Michelin-starred restaurant into the space, then revamped it into the Norm. In a nod to the borough’s diversity, the menu features a wide variety of dishes, from ramen to spiced oxtail to stewed okra -- all of which can be eaten in the presence of art from the permanent collection. Be sure to try Bolton’s pan-roasted chicken, which best shows off his approach to New American cooking, featuring ingredients of the South (stewed okra) and Italy (Tuscan kale and Castelvetrano olives).